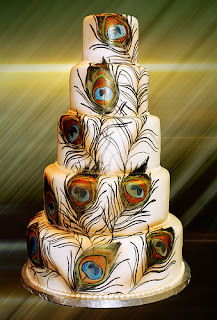 Peacocks are one of the most beautiful creatures on the planet, it's no wonder they always inspire! 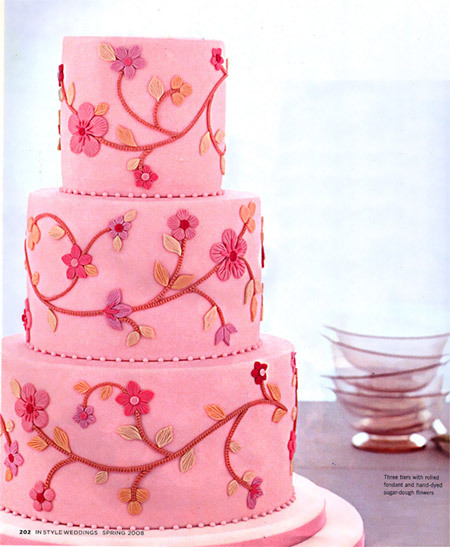 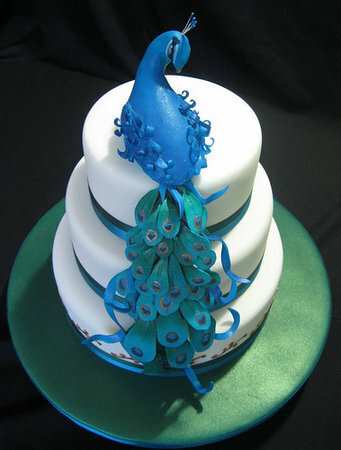 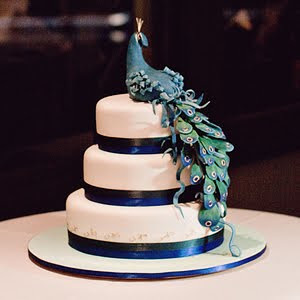 Following is a selection of wedding cakes that draw their main inspiration from these gorgeous birds. 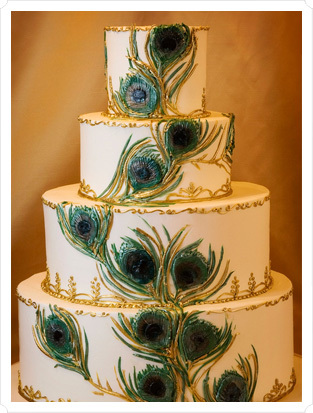 Three tier round wedding cake inspired by peacocks! 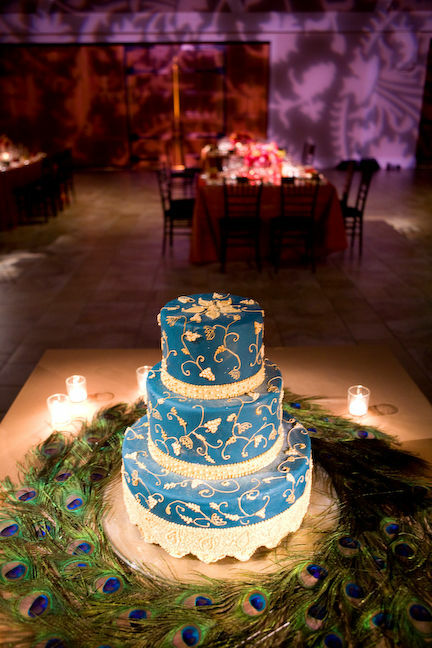 Blue wedding cake set over three tiers surrounded by beautiful peacock feathers. 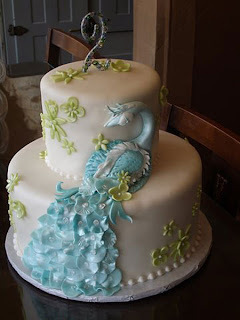 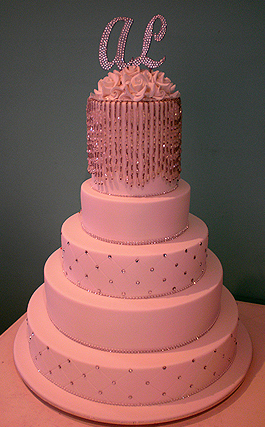 The following two wedding cakes depict lovely white wedding cakes decorated with Peacock feathers made out of icing. Elegant two tier wedding cake in pastel colors with with green sugar flowers and a stunning pastel blue peacock. 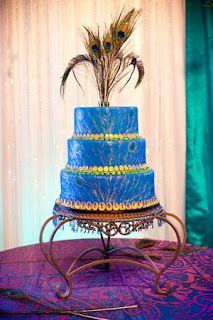 Amazing round three tier royal blue peacock wedding cake with peacock feathers as cake toppers! Three tier white round wedding cake with a blue peacock topper who's sugar feathers cascade down the three tiers. "Peacock Cake: fondant covered, black forest and German chocolate cakes. hand made peacock and tail feathers from fondant and gum-paste. hand painted gold accents on tail feathers." 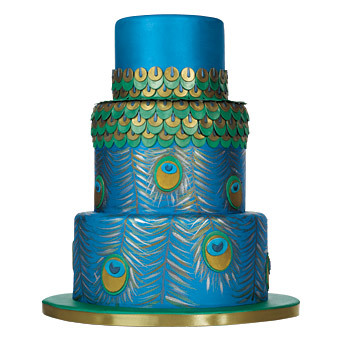 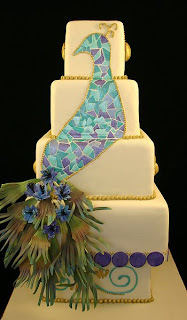 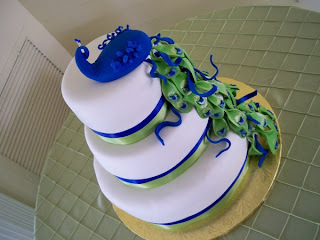 A fabulous topsy turvy peacock cake! 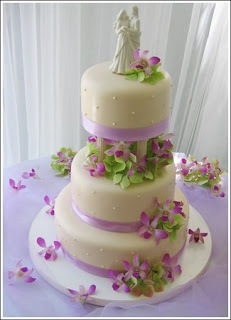 Purple and green is a very popular theme for weddings. 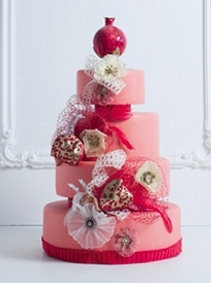 These two colors go together so well in an elegant and chic way. 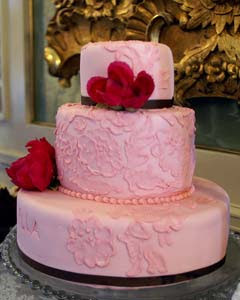 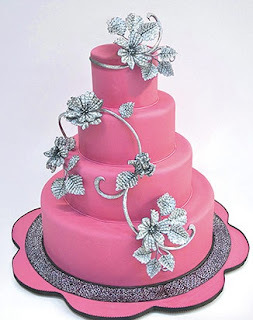 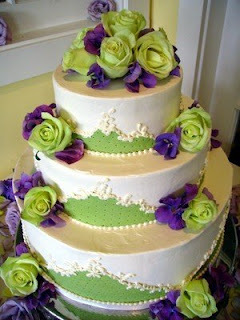 This gorgeous first wedding cake with green roses and purple flowers created by Decadence: Fine Cakes and Confections. 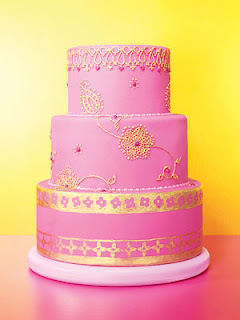 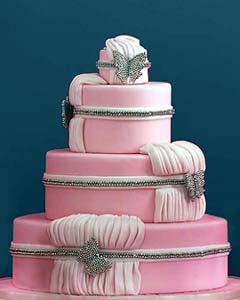 Fleur de Lisa created the decadent ivory buttercream cake. 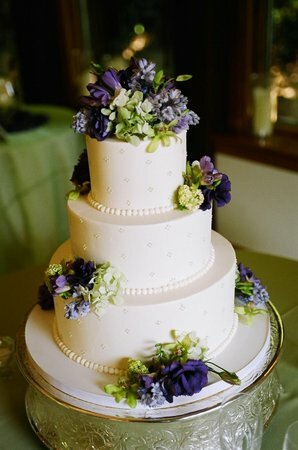 Topped with bouquet-coordinating flowers of green and purple, it was displayed on a beautiful silver plate. The following three tier round cake decorated with purple orchids, green leaves and lavender satin ribbon was designed by Sweet Traders. 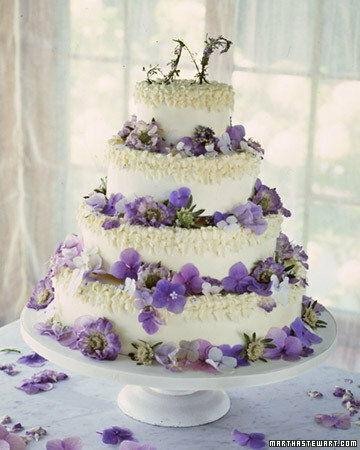 From Martha Stewart Weddings comes this absolutely gorgeous cream colored round four tier wedding cake with and array of pretty purple flowers with green leaves. 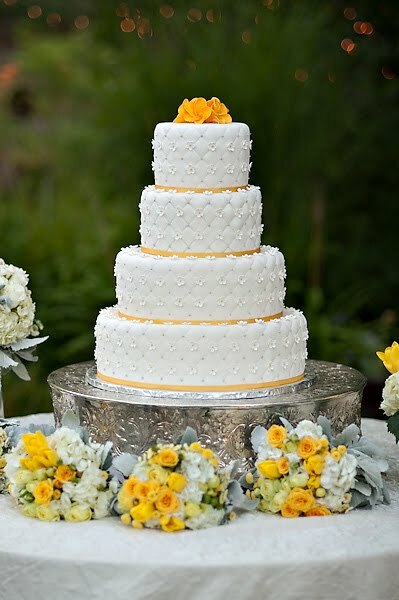 Beautiful white and yellow wedding cakes ideas! 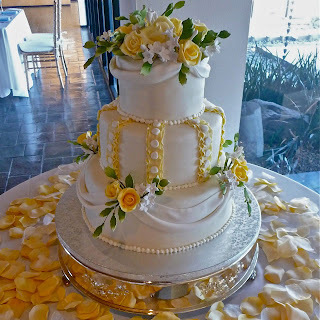 Three tier round wedding cake with yellow sugar roses, green sugar leaves and white fondant draping, a very romantic and delicate wedding cake. 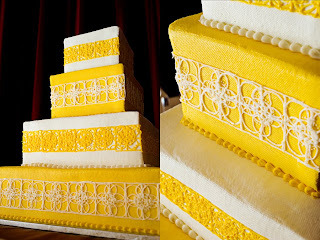 Four tier round quilt textured wedding cake with yellow accents. 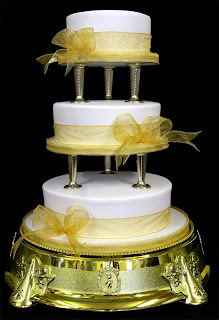 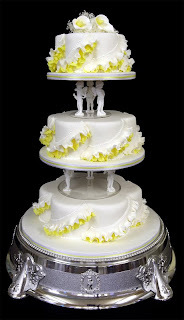 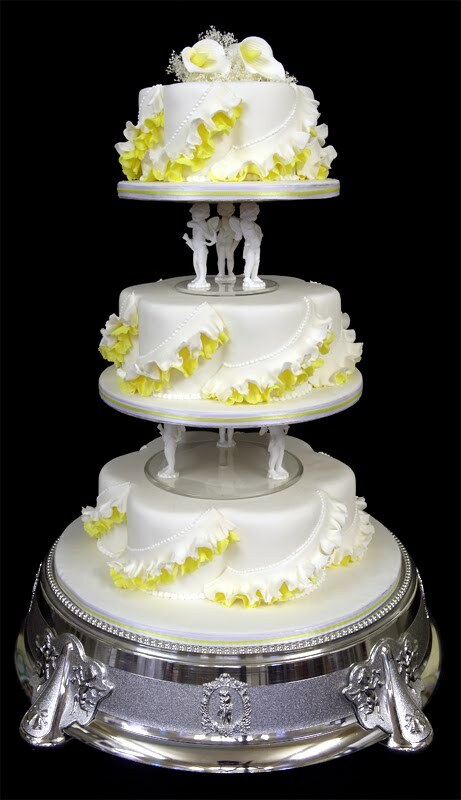 Square four tier wedding cake in white and bright yellow. 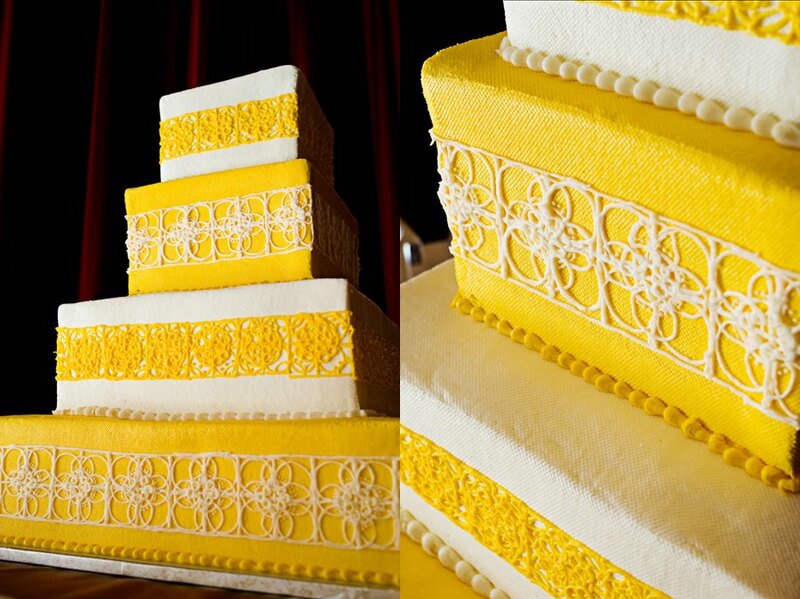 Next are two beautiful whote round three tier wedding cakes separated by columns and with yellow accents. Source for the two cakes above.